Climate fiction, dealing with the world as it will be transformed by climate change and environmental degradation, generally focuses on the coming decades or centuries. Sheehy and Solano’s Beyond the Sixth Extinction takes a much longer view. The book’s opening page provides a scientist’s field report from the “Cagoan District” (present-day Chicago) in the year 4847. The time gap Sheehy and Solano propose is as large as the gap between the Trojan War and the present day. While far from a geological epoch, three millennia is more than enough to create a world alien to the present one. This is not the future, though, that most futurists would envision. Instead of exploring society and technology, Sheehy and Solano envision evolving ecosystems. Chicago is gone and all but forgotten. On the shores of Lake Michigan, polluted marshlands flow into contaminated “brownfields” of gradually dissolving pavement. Animals, plants, and entities in between work to erase the damage humans left behind them. 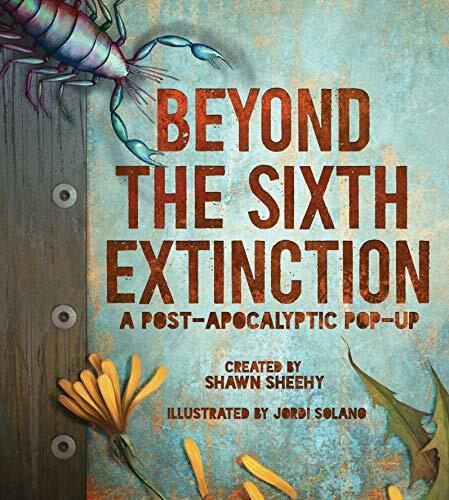 Beyond the Sixth Extinction is an art project. The book is a field report, presented in a battered binder, with brief notes on an ecosystem previously thought to be devoid of life. Each discovered organism is presented “holographically” in an elaborate paper pop-up. Jordi Solano’s work in creating these new beings is truly remarkable. Though all are based on present-day animals, the evolved beings reflect the sometimes-grotesque demands of survival in a radically polluted environment. The mudmop descends from catfish, but its tentacles are many, and its eyes swirl on stalks. It moves through the lake bottoms and marshes of what was once the edge of Lake Michigan. Like the other animals in the book, the mudmop actually works (incidentally) to ameliorate human-caused environmental damage. Its life in the water captures and sequesters heavy metals. Even more striking is the peteybug, the pillbug’s glittering descendant. The peteybug is named for its food: polymers. It metabolizes old plastic packaging. It delights in discarded compact discs, and uses what it can’t devour as part of its exoskeleton. The resulting animal is enormous (the catalogue notes it can grow up to 13 cm in length), but oddly sweet-looking, the most charming of the insects that scuttle through these pages. By and large, Beyond the Sixth Extinction’s creatures aren’t cute. They are the descendants of survivor species with short lives and rapid reproductive cycles that allow them to evolve rapidly. Sheehy and Solano Focus on these “unpretty” creatures deliberately. The book is intended for teen readers rather than adults, and it offers an introduction to biodiversity that goes beyond adorable pandas and shining rainforests. Principles of evolution and ecology pervade the project; they’re accessible without being fully explicated and are obviously intended to spark interest and further reading. Beyond the Sixth Extinction is a playful but dark vision of a possible future. Its aesthetic recalls the fantasy-nightmare visions of Jeff Vandermeer’s Borne and Annihilation. Sheehy and Solano haven’t fully developed the universe they’ve created here, but they have provided an intriguing addition to the genre.